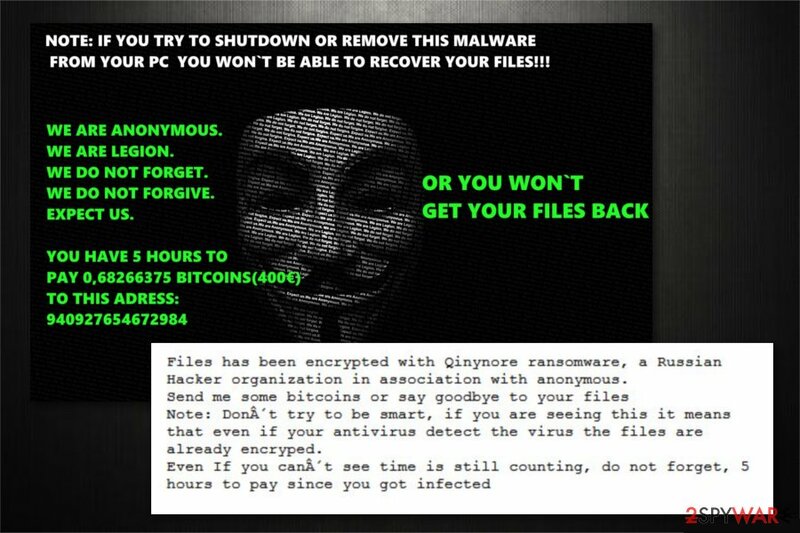 Qinynore ransomware uses sophisticated techniques to infiltrate computers and hide from its victims. Use Reimage to determine whether your system is infected and prevent the loss of your files. Qinynore is a ransomware which demands to pay 400 Euros within 5 hours from the infection or all the encrypted data will be lost permanently. 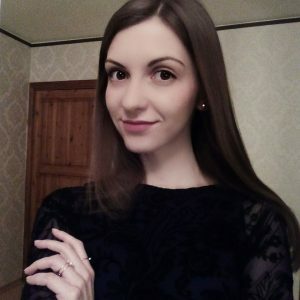 Qinynore is a ransomware which encrypts all information stored on the targeted computer and demands to pay a ransom of €400. Experts note that this virus is considered to be a new variant of the infamous Hidden Tear ransomware. After file encryption, victims receive YOU_MUST_READ_ME.rtf file as a ransom note, and all encoded documents contain .anonymous extension at the end of the file-name. Additionally, the desktop wallpaper is changed to the picture named LOL.jpg. Hackers claim that people have 5 hours to make the transaction. Otherwise, the files will be lost permanently. Furthermore, they are asked to pay a specific amount of money as a ransom to receive Qinynore decryption software. Criminals give 5 hours for people to complete the transaction or the information will be deleted. However, our experts warn that hackers should never be trusted. Qinynore is a file-encrypting virus which is classified as a new variant of Hidden Tear ransomware. Usually, once the payment is made they either demand to pay more or never provide the decryption key. Likewise, following the orders of the cyber attackers is not the wisest decision. If you notice files with .anonymous extension, you should run a full system scan with a robust antivirus immediately to remove Qinynore ransomware. 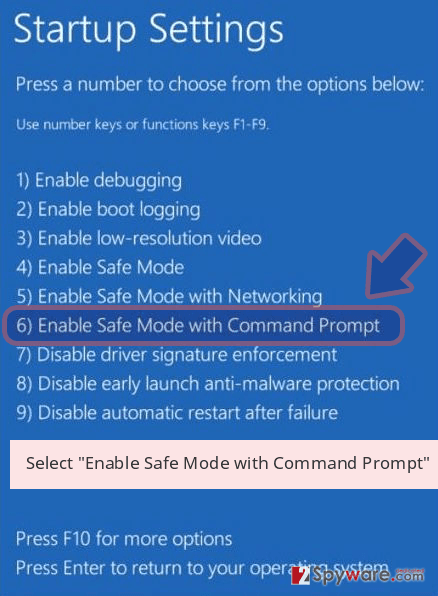 In case you are unable to start Qinynore removal, try booting your computer into Safe Mode first. Instructions showing how to do that are provided below. Additionally, they include decryption methods that may help you recover files with .anonymous extension. For automatic virus damage fix, we suggest using Reimage. According to the experts, the main ransomware distribution source is spam emails. Note that users fail to identify attempts to infect their computers as electronic letters impersonate invoices or shopping receipts from well-known companies. Unfortunately, the innocent-looking attachment might hold the payload of the ransomware and execute it once clicked. The message contains grammar or spelling mistakes. 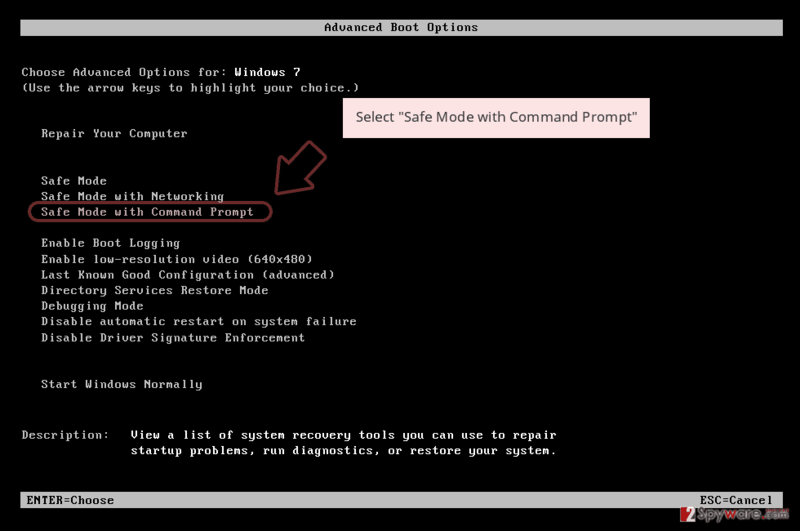 If your PC is infected with Qinynore ransomware, you should first reboot your computer into Safe Mode. 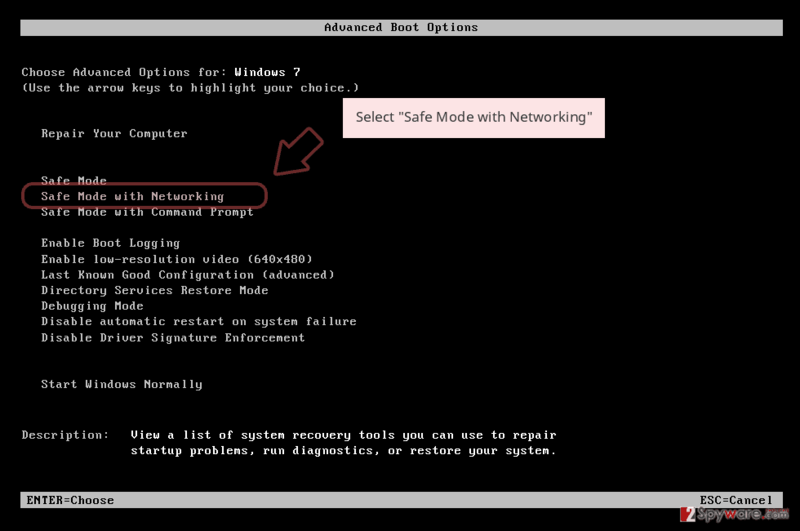 This step is crucial as the virus will block the installation of the antivirus otherwise. 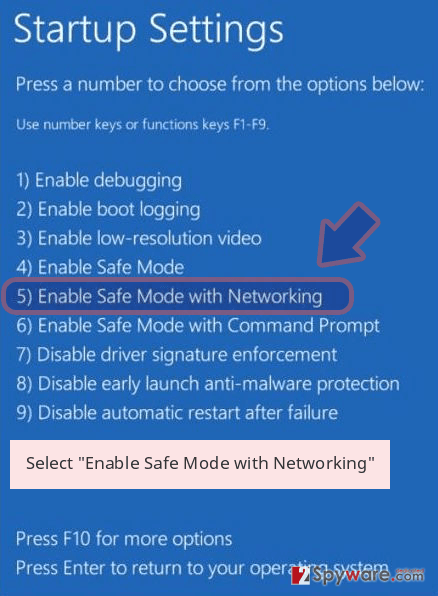 Those who are not aware of how to enter Safe Mode can use the guide attached below. Then to start Qinynore removal, you must download and install a reliable antivirus program. Experts suggest using Reimage, Malwarebytes MalwarebytesCombo Cleaner, or Plumbytes Anti-MalwareMalwarebytes Malwarebytes to protect your system. You can remove Qinynore virus by running a full system scan. Afterward, check the guidelines below to learn how to recover encoded data. Log in to your infected account and start the browser. Download Reimage or other legitimate anti-spyware program. Update it before a full system scan and remove malicious files that belong to your ransomware and complete Qinynore removal. 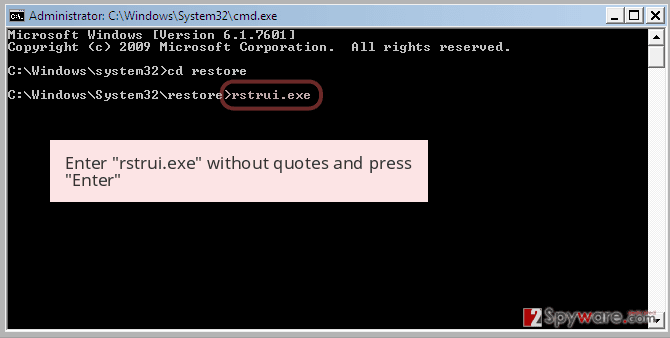 When a new window shows up, click Next and select your restore point that is prior the infiltration of Qinynore. After doing that, click Next. 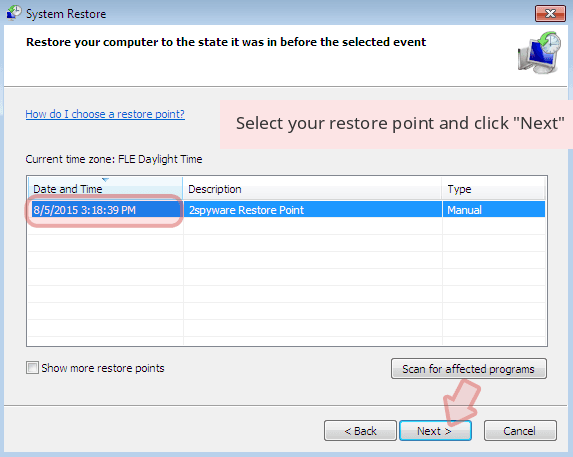 Once you restore your system to a previous date, download and scan your computer with Reimage and make sure that Qinynore removal is performed successfully. Guide which is presented above is supposed to help you remove Qinynore from your computer. To recover your encrypted files, we recommend using a detailed guide prepared by 2-spyware.com security experts. According to the experts, users might try installing this professional tool to help them retrieve encrypted data. Keep in mind that this software is also useful if you have accidentally deleted important files by yourself. You can take advantage of the inbuilt feature which allows you travelling back in time to recover damaged data. For more details, read the instructions below. 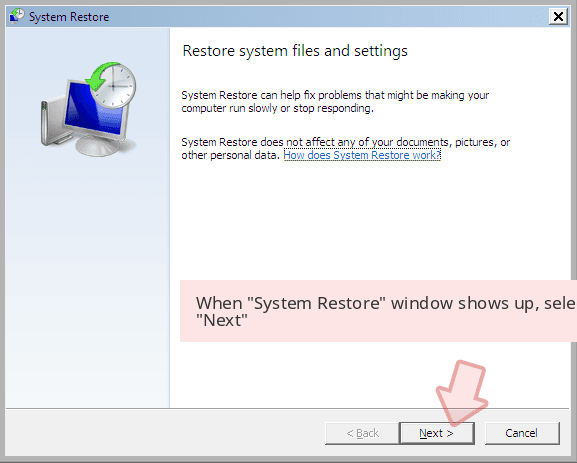 Although, this method requires System Restore function to be enabled before ransomware attack. ^ Brady Gavin. What Is A File Extension?. How-To Geek. We Explain Technology. This entry was posted on 2018-09-24 at 10:30 and is filed under Ransomware, Viruses. You can quickly scan the QR code with your mobile device and have Qinynore ransomware manual removal instructions right in your pocket. How did you remove Qinynore virus?